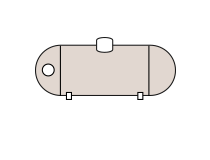 Electronic Remote Pilot – (Vented & Vent Free) This control type will include a remote and have a non-standing pilot that will ignite when activated by the remote, allowing gas flow to the main burner. With vented sets, the flame height will be fixed. With ventless sets, the remote will also allow you to adjust flame height. No Pilot – Match light – (Vented Only) This will not feature a valve and will only be available with vented natural gas log sets. This option is not available with any ventless log set or any propane set. The burner will be lit with a match and the gas flow/flame height will be controlled with a previously installed manual ball or gas valve in the fireplace. Typically, this valve is located outside of the fireplace opening on the floor or wall. On/Off Remote Pilot – (Vented & Vent Free) This pilot kit will feature a standing pilot that will have to be lit manually. The optional wall switch, On/Off or On/Off thermostatic remote will ignite the burner only. The flame height may be adjusted manually with the valve control knob, but not with the optional remote. Safety Pilot – (Vented & Vent Free) This is the most basic safety valve available for vented propane log sets but is also available with vented natural gas log sets. The pilot is lit manually using either a match or long stem butane lighter via the valve control knob. After a few seconds, the pilot flame contact with the thermocouple will allow gas flow to the main burner. If the pilot flame is extinguished for any reason, gas flow to the main burner will cease, preventing the open flow of gas into your home (this will be the case with any pilot kit, with the exception of the natural gas match lit option). Variable Flame Remote Pilot – (Vented & Vent Free) With vented log sets, this pilot kit will feature a standing pilot that will have to be lit manually. The optional Variable Wall Switch will turn on the flame and adjust the height up and down. The optional Basic Variable Remote will turn the unit on and off as well as adjust the flame height up and down, while the Deluxe Variable Remote will add thermostatic control. With ventless log sets, your results may show both standing and non-standing pilot kits. 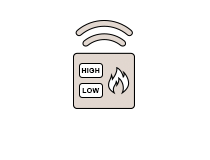 Either option will include a remote, but only the �Variable Flame Intermittent Pilot� option will feature a non-standing pilot flame that may be lit with the remote. You will be able to select either option on the left-hand side of the page in your filtered results. Watch this video on how to measure your fireplace for gas logs. If I just need 1 or 2 10" pieces, where could I find that? Unfortunately, we only offer full log sets. Do you have ventless gas logs that are certified for high altitude? Unfortunately, we do not carry any ventless sets that are certified for high altitude. Can a ventless fire log set be installed in a fireplace with a vent? If so, can it be operated with the vent closed? You can indeed install a ventless log set into one with a vent, and operate the set with the damper closed. Can I use different model of ventless fireplace logs on my present burner? You should only use log sets designed for your specific model of ventless burner. Sets are not interchangeable between brands. Be sure to check the model of your burner. Is there a difference between fireplace logs that are used in propane gas fireplaces and those used in natural gas fireplaces? Usually not the logs themselves, just the burner and valve have differences. Do the exterior gas logs need to be covered when not in use? As the burner is made of stainless steel and the logs are made of concrete, it is not required that you cover the set when not in use. How safe are ventless logs? We have posted quite a bit of information on our site regarding this topic here. What set of natural gas logs has the tallest flame? In general Peterson Real Fyre tends to have the strongest and best looking (most realistic) flame. They also offer set that have variable flame adjustment. Which heat a large room better, vented or non vented? Non vented will produce the most heat. Is it true that it is not safe to use vent free logs for extra heat? Vent free logs are safe, as they come equipped with an oxygen depletion sensor which will shut the unit down if there is any drop in the oxygen level of your home. Are there gas log solutions that look more contemporary (meaning they don't look like logs)? These options are shown here. Can I reuse vented gas logs if they got wet? Vented gas logs will be composed of either ceramic fiber or solid refractory ceramics. In the case of ceramic fiber logs, they are porous and may need to dry prior to use. With solid refractory ceramic logs, they can simply be wiped down and will not hold water. There would be very little risk in either case as water vapor is already a harmless byproduct of construction and masonry chimneys are not all water-tight to begin with. How do you know if you need to change the logs in your ventless gas fireplace? How often do they need to be changed? There is not a set time frame for log replacement, as use of the fireplace will vary from customer to customer. If the logs begin to chip, emit an acrid odor, or are heavily discolored by soot, replacement should be considered. Can we have gas logs installed if we have a gas lighter (line in the firebox) that has been used to burn wood? You can indeed. Wood burning fireplaces can be converted to a gas log installation, as long as you have the proper sizing needed to house the logs. What are the different types of pilot lights? For natural gas installations, you have the option of using no pilot at all. A manual gas valve is opened and the gas must be ignited by a match or lighter. Having no pilot allows for a larger log set to be used, but is a bit more work to light. Propane installations do not have this ability, due to the increased volatility of LP gas. The next step up is called a safety pilot kit. This system uses a small manual valve with a standing pilot. The pilot is lit at the beginning of the season and anytime you would like to light the set, a control knob is rotated to the "on" position. This pilot allows you to quickly light the set and the valve is small and easy to hide. The last level is the remote pilot kits. These sets allow the option of a remote or wall switch for control. There are different variations, including and on/off pilot, a variable flame height pilot, and an electronic ignition pilot. The electronic version uses a spark ignitor that saves fuel over the standing pilot. The only down side to the remote systems is the larger valves force the use of a smaller log set. Generally speaking, when should gas burners be replaced with a ventless gas log fireplace? Is there a set rule of thumb? Manufacturers do not specify a set replacement date for vent free burner systems, however they should have a yearly service and evaluation of condition. If significant corrosion or any perforation is present on the main burner or the gas valve is no longer maintaining the correct flow pressure, the system should be replaced. Why do we get this awful smell when burning with the vent partially closed? It is likely that the damper is closed too far and some combustion byproducts are spilling into the room. A good way to test this is to light a match or hold a lighter near the top of the fireplace opening when the set is burning. If the flame blows away from the opening, the set is spilling byproducts into the room. The damper will need to be opened in small increments until the spillage stops. What is the difference between a basic and deluxe remote? Are there other choices? The Peterson basic remotes will offer the ability to turn the log set on and off remotely. The variable model will also allow you to adjust flame height. The deluxe model offers a thermostatic setting as well, allowing you to program a desired room temperature that the log set will modulate to. Because of the modulating nature of the gas valves, one of these remotes must be used. Other models are not compatible. What type of logs do I need if I have a fireplace that is open on both sides? These logs are known as see through (sometimes spelled "see thru") log sets. The options we offer can be seen here. I will be happy to answer any questions about the different pilot options and sizing. How can you tell if your gas logs are ventless? The first thing to check for is a manufacturer name or model number on the burner or build tags. All vent free log sets will come with a build tag of some kind that will have this information. If this is not present for any reason, the next thing to check is if the logs have any locating pins or notches/grooves that allow them to be set up only one way. Vented logs will not have these grooves and can be set up as you desire. Why would anyone get vented gas logs instead of ventless gas logs? Wouldn't the ventless provide more heat? Is the ventless dangerous? 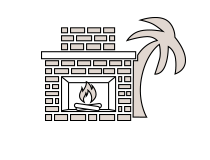 Vented gas logs are primarily chosen if the look of a real fire is wanted, without the additional heat. Vented sets tend to have a high flame and the logs can be placed at random, giving the look of a real wood fire. Ventless logs have a lower flame and are very particular about log placement. Thus, they are slightly less realistic. However, in a large room with good air circulation, they are an excellent source of supplemental heat. In smaller rooms, they can only be run for a certain amount of time, as they can deplete oxygen from the air and lead to excess moisture being added to the environment. Do you make a set of gas logs that have loose individual fake logs that can be custom arranged? Unfortunately, the log sets that we offer are designed to be setup only according the manufacturer's instruction. The logs themselves are designed only to be set in one position around the burner pan. 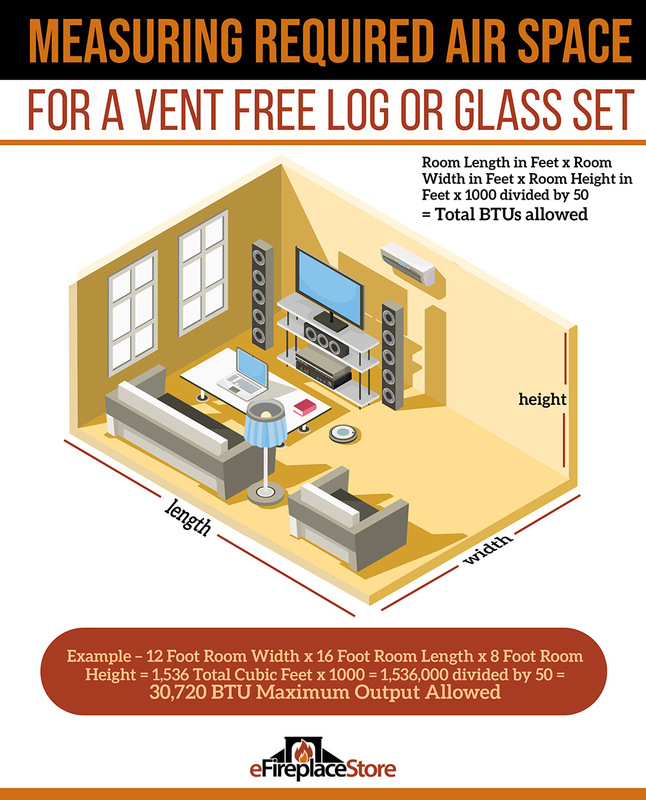 What is the difference between vent-free and vented gas logs? Which is safer? Which is better? 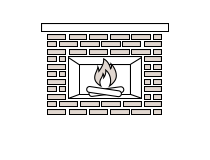 Vented gas logs are generally considered to be of a decorative nature and are not intended to supply supplemental heat to the room. They are the safer of the two varieties, as all combustion byproducts are vented to the chimney. 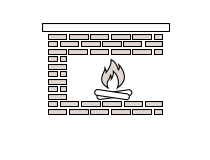 Ventless gas logs are far superior for supplemental heating, but have a lower flame and are less realistic than vented logs. They should not be used for more than four hours continuously, as they draw combustion air from the room and can increase moisture levels to a point of condensation forming on windows. Can you convert natural gas logs to propane? Indeed, most vented gas logs can be converted from one gas type to another. The required conversion pieces vary with manufacturer and log set size. Vent-free log sets, on the other hand, cannot be converted. There are several things you need to consider when you are buying fireplace gas logs for a new or existing fireplace. First is the fuel source. You can buy gas logs that burn either natural gas or liquid propane. Also, one note you may see fireplace logs referred to as fake fireplace logs or gas logs for fireplace in other places online so if this isn't your last stop for research, be aware. If you already have appliances that use natural gas, that might be the easiest choice. Liquid propane can be used anywhere but usually requires you to install a tank outside your house. Second is whether to go vented or ventless. This decision takes into account the main purpose of your artificial fireplace: is it mainly for ambiance or for heat? Gas fire logs appeal to those homeowners who are tired of continually needing to sweep out their fireplace, cut and stack wood, maintain and sweep the chimney, and are just tired of paying for firewood each year. Or, you could be looking to upgrade from the traditional log appearance to the contemporary appearance you can get with fireglass. 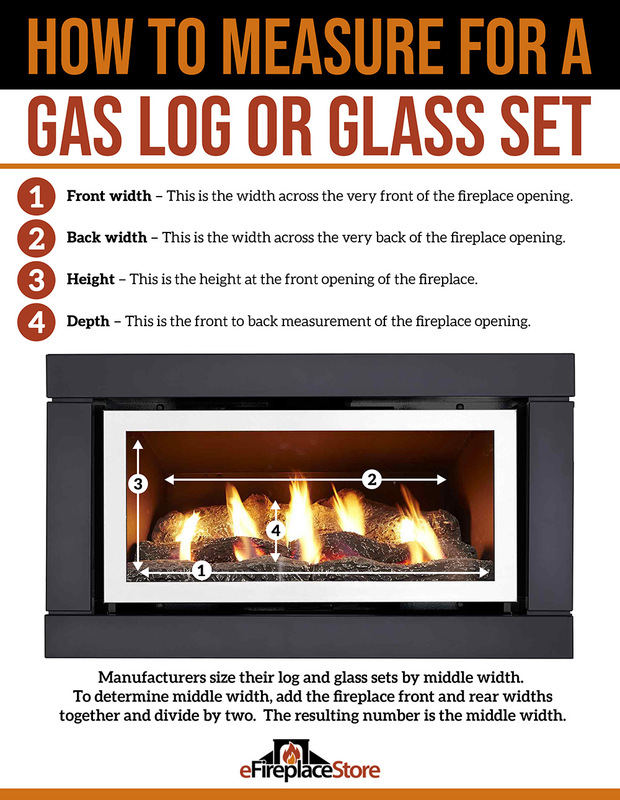 If you're looking for a simpler way to enjoy your fireplace and want to have a fire during social gatherings, but you don't want to have to monitor the fire constantly, then a gas log or fireglass set is the ideal choice for you. Prior to making a purchase of your gas fireplace logs, you will need to investigate whether or not you already have a gas line in place. First, you'll want to make sure that you have a gas line to your home, then you'll want to make sure that you have a gas line running to your fireplace. If there isn't a gas line to the home, you will need to contact their local utility company to find out the requirements to have a gas line installed. It is rare for a gas line to not already be in place, but for rural locations or homeowner contracted homes, it could be a possibility. If there isn't a gas line to the fireplace, then you'll want to check with the local code enforcement office to see what requirements exist for the gas line to be run. A permit may need to be pulled, and an inspection will likely follow the installation. You should check your area for local NFI Certified Techs or gas fitters to see who is available to complete the installation and the cost for the service. If a gas line is already in place, a permit may not be required, but it is recommended to have a plumber perform an inspection of the gas line to ensure it is sound, even if you plan a DIY installation of your gas log set. Some of the most well-known manufacturers of gas logs are also some of the finest manufacturers in the industry, and you can't go wrong with any one of these brands. R.H. Peterson (Real Fyre) - These are the makers of the Real Fyre gas log line, offering a diverse collection of both vented and vent-free log sets. R. H. Peterson has been manufacturing gas log sets for over 60 years, and are one of the industry pioneers. Their log sets are mostly cast refractory, with a focus on striking realism in their presentation. Golden Blount - While they're a younger company in the industry, Golden Blount has excelled in the production of cast refractory log sets that fill the needs of most homeowners. They offer a wealth of highly configurable burner systems that allow the customer to pair their log sets to the exact burner system they desire. Empire Comfort Systems - A longtime builder of gas floor furnaces and wall heaters, Empire diversified into fireplaces and gas log sets and was the first to employ oxygen depletion sensors in their vent-free gas log sets. An industry leader in vent-free technology, their sets feature many valve and control options, realistic flames, and durable log sets. Rasmussen Gas Logs - Now a common technology in the gas log industry, Rasmussen pioneered the sand pan burner system, which uses silica sand to diffuse fuel gas and create a realistic dancing flame pattern. This, coupled with highly detailed log sets, means the company continues to be a well-recognized name in the hearth industry. Gas logs are a vital piece of an attractive and easy to operate fireplace. There are many different options and configurations to choose from. Natural Gas, propane, vented, vent-free, see through... What do they all mean, and how do they work together? Truthfully, there are only four major options in gas logs, and only two decisions to make before you get your dream fireplace. The first choice would be a fuel type. 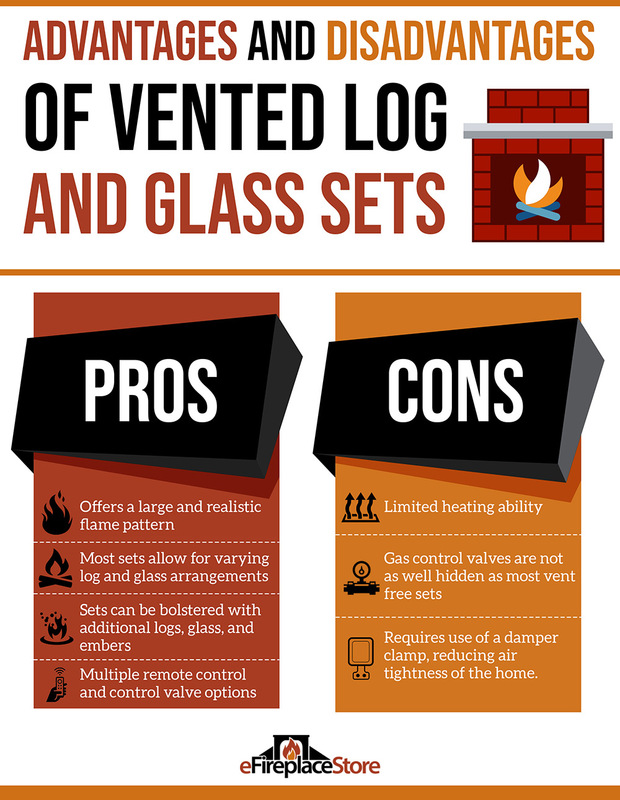 The second choice is whether or not you need a vented or vent-free log set. There is a final set of options that you'll also want to take into consideration. Are you looking for a modern fireplace design, with fireglass instead of the more traditional log sets? Or do you relish the traditional appearance of that a quality log set offers? There are two types of gas utilized for petroleum byproduct fueled hearth appliances. While there is very little visual difference in the flames produced by either fuel, there are still several factors to consider. It is important for you to know what fuels are available to you, and how installation varies. Natural Gas - Consisting mostly of alkaline rich methane, natural gas is a lighter than air flammable gas that is commonly found in conjunction with petroleum deposits deep within the Earth. While harmful to the atmosphere in its raw form, natural gas is a clean burning and lower cost fuel that is not a volatile as propane. Because of the light weight of this gas, it also dissipates in the air and is less prone to form dangerous pools if a leak occurs. If you live in a city or town, it is very likely that there is infrastructure already in place to supply your home with natural gas. Natural gas is even available in some rural areas. If you're unsure of what is available to you, you should contact your local utility supplier to learn more. For homes that have previously only had electric appliances installed, a feeder line from the streetside gas main may not be in place. Many gas suppliers will introduce a supply line to the home and install the meter at a discounted cost in anticipation of gaining a new customer. Before you look into installing a gas log set, it is prudent to find out how much the gas supply line, gas meter, and in-house supply piping will cost. Natural gas contains approximately 1,000 BTUs per cubic foot. While this is less than the BTU input of propane gas, the low cost offsets the difference. Because of the large distribution network that is already in place a majority of homes will use natural gas appliances. 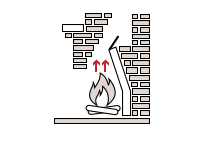 It is important to note that most vented gas log sets can be converted between gas types, but most vent-free gas log sets cannot. Propane Gas - Propane gas is a hydrocarbon compound that results as a byproduct during the processing of natural gas. When stored under pressure, propane condenses into a liquid form and is often referred to as LPG or liquid propane gas. It is because of this tendency to condense that propane is not suitable for distribution via pipelines over a long distance. Propane is a dense fuel that is heavier than air, meaning that it will pool if allowed to dissipate into the surrounding air. Propane is also far more volatile than natural gas, with a rating of approximately 2,400 BTUs per cubic foot of gas. If you live in a rural area that is far removed from gas utilities, chances are that you will have to rely on propane gas as a fuel for your gas log set. If your home already has gas appliances, it is likely that you already have a large above or below ground propane tank installed. If you already have gas appliances in your home, you need only ask the utility company if they have a truck come to deliver the fuel gas each season. If yes, propane. If no, natural gas. 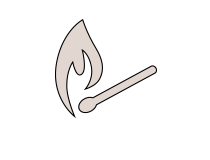 As with natural gas appliances, it is possible to convert most propane vented gas log sets to a different fuel. However, it is usually not possible to convert most vent-free appliances. The reason for this is because vent-free appliances can potentially release harmful emissions into the room air if converted improperly. This is not necessarily a problem with vented appliances because the chimney system will carry the byproducts and dissipate them into the atmosphere. Vent-free models are built, tested, and sold to only burn the original fuel they were designed for. If you purchase a vent-free gas log burner that is fueled by propane and then the utility company installs natural gas in your area, you will be forced to replace the entire burner assembly. Gas Orifices - If the two gases are so different, you're probably wondering how the log sets can burn the same. The answer is due to the orifices. Also known in the industry as gas jets, an orifice is a small fitting that is installed in line of the gas flow. Models that have a standing pilot will have an orifice for the pilot and at least one orifice for the burner itself. Large models may have multiple orifices. Each orifice will have a small hole drilled through the center to meter the correct amount of gas to the pilot and burner assembly. Because of its lower BTU potential, natural gas will use larger orifices, while high volatility propane will use smaller orifices. The result is an identical or nearly identical flow of BTUs to the pilot and burner assembly, meaning that no matter what fuel you are burning, the overall look of the gas log flame is the same. While these orifices can be easily swapped for most vented appliances, they are usually integral to vent-free pilot assemblies and equipped with anti-tampering devices for vent-free main burner orifices. Burner assembly - Many models use what is known as a pan burner, which generally consists of a slanted pan filled with sand for natural gas units or vermiculite for propane units. Both media types diffuse the gas after it exits the gas pipe buried beneath the media. This allows the burner to create a very natural looking flame. Other pan burners follow the same concept but may use a pan filled with ceramic pebbles to diffuse the gas. Some low-cost models utilize what is known as a tube burner, which is usually an aluminum tube with rows of perforations. Because the flame is very static and cannot divert from the tube, these systems lack the realistic appearance of other burners. Log grate - Designed to hold the log set and mimic the look of a traditional wood log grate, this item is sized to the specific burner and log set being installed. 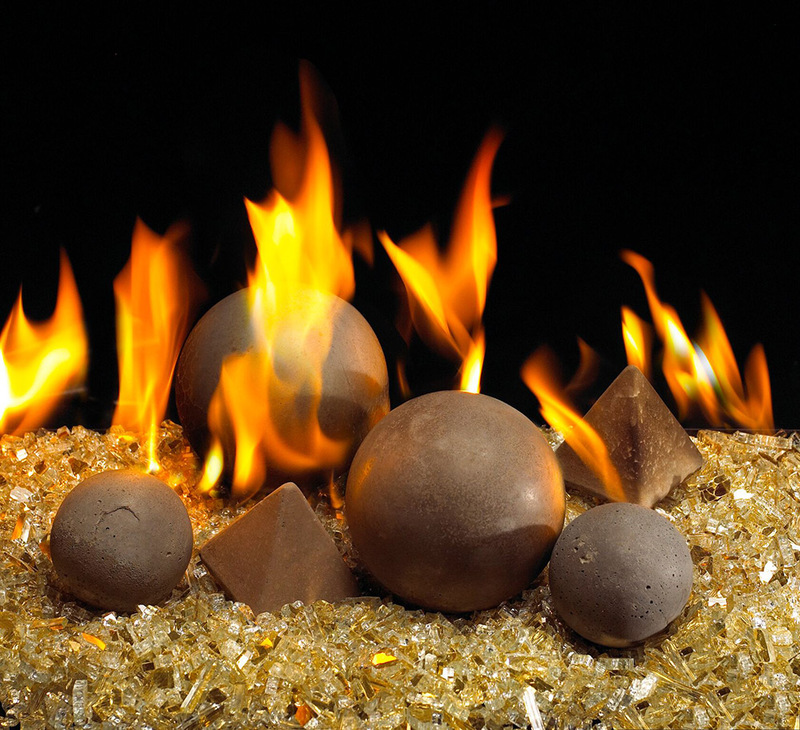 Decorative embers or lava rock - Many sets include a ceramic wool-based material that glows when heated. The material is designed to loosely cover part of the burner or sit directly in front of it, giving the illusion of a real bed of hot embers. If the set includes lava rock, it is usually broken down into 1/4 or 1/2 inch pieces and is used to surround the burner, but not cover it. The idea is to cover more of the fireplace floor and make it look less sterile. With a wood fire, hot coals will fall away from the fire and smolder out. The lava rock mimics the look of these coals. Log set - The log set itself consists of either ceramic refractory (heavy cement) or ceramic fiber (lightweight fibrous) logs. Each has their advantages and disadvantages. Ceramic refractory logs are very durable, do not shift easily because of their weight, and are usually hand painted to exceptional detail. However, they tend to accumulate soot more readily than ceramic fiber logs, and they do not glow when heated. Ceramic fiber logs are manufactured from the same basic material as the glowing ceramic embers. As such, they are lightweight and are resistant to flame damage. Depending on the exact design, some models will also glow when heated for added realism. However, ceramic fiber logs do break down with age, and their coloring is not as realistic as ceramic refractory log sets. A vented gas log set may be the best option if you desire simple installation, freedom of log arrangement, and a less intense heating capacity. Many manufacturers will recommend primary or secondary log arrangements, but in almost all cases, it is possible to play with the arrangement and find a pleasing set-up. Additionally, it is not an issue if the flame hits some of the logs directly, but it is recommended to avoid doing so to minimize soot build-up. When installing a vented log set, it is recommended to have your chimney swept beforehand to eliminate the possibility of lingering wood ash odor in the room. The chimney should also be in good working order. If there were problems with the chimney venting a wood fire, the same issues will be present for a vented gas log set. Never assume that a vented gas log set will solve chimney problems. Vent-Free - Vent-free log sets excel as supplemental room heaters. All the heat generated by these models stays in the room, thanks to the ability to close the chimney damper. There are drawbacks, however. Unlike vented gas log sets, vent-free models are limited to a maximum of 40,000 BTUs per hour. This limitation means that the set will have a lower flame and will look less realistic, especially for larger sets that spread the fire out over a wide area. Vent-free log sets also release moisture vapor to the room as they operate, meaning that smaller rooms can start to feel humid after prolonged burns. It is recommended to use a vent-free log set for no more than 4 hours continuously. Lastly, many municipalities and some states do not allow the use of vent-free log sets. Before purchasing, you should verify with your local code office to determine if vent-free units are permitted in your area. Vent-free systems can be very versatile despite their downsides, and make an excellent choice in the right circumstances. Vent-Free log sets are often susceptible to mistakes made in the fireplace acquisition process, and you can check out our 5 Biggest Mistakes Made When Purchasing A Fireplace article to make sure that you're avoiding the most common problems. Burner assembly - Vent-free burner systems feature more advanced engineering over vented models. In order to maintain indoor air quality and burn cleanly, they typically feature an enhanced orifice system and do not use loose media. Pan model burners do exist but are typically filled with ceramic pellets that do not negatively affect room air as the gas burns. The burner pan is also designed for a particular log arrangement around the flame, instead of over them. This prevents direct flame contact to the logs and the release of soot and other byproducts into the air. Other models use a tube burner, also featuring a similar placement of the logs so as to not cover the tubes. They will also feature numerous small gas ports, rather than the larger ones found in the vented systems. The small ports allow very fine metering and complete combustion of the fuel gas. Log grate - Tube burner systems will usually feature either an integral "mini" grate or some sort of faux grate. Manufacturers cannot take the chance of the grate being arranged improperly over the logs, so the grate will either be part of the burner or will be able to attach in only one way. Some pan burner systems use no grate as all, using the height of the burner pan and a decorative front to mimic the look of a traditional grate. Decorative embers or lava rock - As with vented sets, many vent-free models use ceramic embers for added effect. To maintain air quality, the embers must be arranged just as instructed in the owner's manual. The embers are placed adjacent to the gas ports, close enough to glow when heated, but not close enough to obstruct gas flow and produce soot. Lava rocks are often included and serve the same purpose as those for vented log sets. Log set - As with vented log sets, you have a choice between ceramic fiber or ceramic refractory logs. However, since the log configuration is crucial, manufacturers will employ several techniques to avoid improper installation. For ceramic refractory logs, a series of indentations and corresponding pegs are cast into the legs. These fit together and maintain the correct position of the log set. Some models will also have notches designed to fit over the log grate. Similar to refractory models, ceramic fiber sets have a series of pressed-in pins or guides to fit into corresponding holes on other logs to avoid improper assembly of the log set. As previously mentioned, vent-free sets are not as aesthetically pleasing as a vented model, but the gap between the two has closed significantly. For supplemental heating in large spaces, they are both excellent options. Other considerations must be made. Vent-free units have BTU limitations for where they can be installed in your home. There are also requirements for how maximum heater rating per the definition of undefined space. These limits are 10,000 BTUs for bedrooms and 6,000 for bathrooms. Any rooms that are connected via doorways that cannot be closed or archways should be considered cumulative and undefined space. 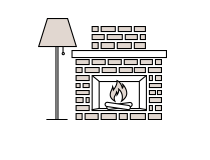 Match Light - This is the simplest method of lighting a log set, and usually only available for vented natural gas systems. In these cases, the burner assembly has no valve or pilot assembly attached. Instead, the gas supply line is connected directly to the burner. To ignite, simply hold a lit match or lighter just above the burner assembly and below the log set. With the external gas valve open to supply the gas to the set, the gas will ignite. This is a good option for the greatest realism and lowest overall cost, with the added plus of no pilot or valve to hide. 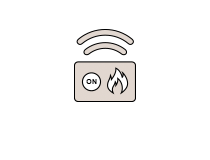 Safety Pilot Light Valve - This system can be found on almost all vented and vent-free systems, both in natural gas and liquid propane configurations. This is usually a simple brass control valve that is affixed to the burner assembly and utilizes a standing pilot light. The system has three settings: Off, Pilot, and On. The gas control valve adjacent to the fireplace can be left open at all times. During the offseason, the safety pilot valve can stay in the "off" position. For the regular burn season, the valve can be turned to the "pilot" position, and the pilot assembly lit. When the use of the fireplace is desired, you can simply rotate the control knob to "on", and the burner will light. 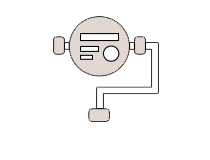 Rotating the system back to "pilot" will turn the main burner off, but leave the pilot lit. Should the pilot blow out in either standby or during operation of the main burner, the entire valve will close and stop the flow of gas. Many safety pilot valves are on/off control only, but some brands, such as Empire, have a 3 step flame height adjustment. Utilize a remote control or a wall switch for operation. The gas valve has a terminal block that will allow direct wiring of a wall switch immediately adjacent to the fireplace or the use of a battery operated remote receiver and transmitter set. Usually has a push button ignitor for the pilot. 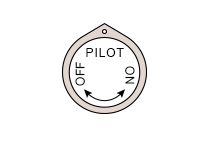 Unlike almost all safety pilot valves that rely on a match or lighter to ignite the pilot flame, on/off millivolt valves usually have a piezo ignitor to light the pilot. Many models offer manual flame height adjustment. Many valves have a built-in regulator with an adjustment knob that allows flame height to be regulated. This is a manual-only feature that cannot be automated in most cases. Hi/Low Millivolt Valve - This system can be found for almost all vented and vent-free systems in both LPG and NG configurations. This system builds still further on the on/off millivolt system by adding automatic high/low flame adjustment. Almost all valves that have this type of system require that the high/low flame control be done via a special remote control or wall switch. The system will usually not allow manual adjustment and damage to the valve can result if it is attempted. Electronic Valves - This system can be found for almost all vented and vent-free systems in both liquid propane and natural gas configurations, but the exact features and capabilities vary by brand. This type of system trades a standing pilot system for a fully electronic spark ignitor. The spark ignitor lights the pilot and the pilot only remains lit while the main burner is in operation. This is designed to save on gas consumption by not having a pilot light lit at all times. Almost all of these systems have a manual on/off toggle switch for basic control, but they are ideally utilized with a remote. Many models come with the remote as standard. 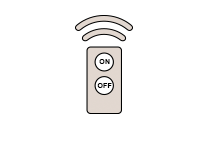 The most basic systems function like an on/off millivolt valve, allowing only on/off control from the remote only. More sophisticated systems will use a multifunction remote that will usually include high/low flame control, timers, and thermostatic settings. Available in nearly every option of gas fireplaces, fireglass is the ultimate modern touch for a traditional home feature. Fire glass sets usually feature a gas valve that is concealed more effectively. The low profile of these sets means that the valve would be an unwelcome distraction and the manufacturers recognize this by placing the valve in the back of the set or beneath the burner within a cavity or platform. Both vented and vent free sets use specific media for each system. Some sets use 1/4" tempered glass pieces, while some go as large as 3/4" pieces. Others use round glass droplets or will also allow for decorative fire art or shapes to be added. It all depends on the system. 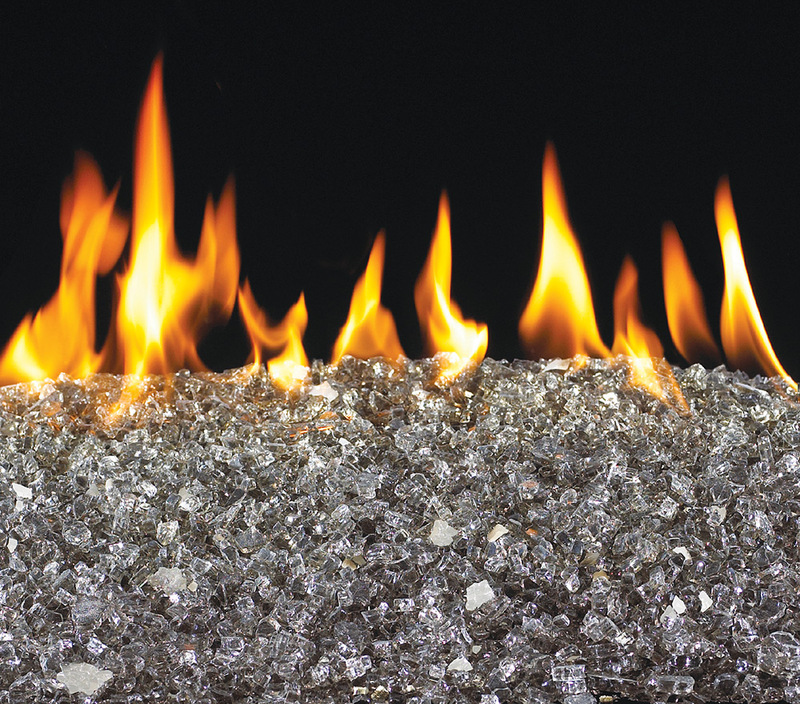 Vented Fireglass Sets - There are two common setups for vented glass systems. The first is a type of retrofit to a standard log burner. Essentially, the manufacturers take a burner system that was initially conceived as a gas log burner, remove the grate, and then add a screen matrix to support the glass over the burner pan. The result is an elevated platform with a reflective layer of fire glass that can also usually receive decorative shapes. The second type of system is a pan burner. A pan burner is a very low profile system that usually stands only a couple of inches, with a perimeter lip, an internal burner tube, and a diffuser directly over the burner to help fan out the flames. The pan is mostly filled up with sand or vermiculite, then a layer of glass or fire shapes is added. Because this system is so low profile, it lends itself towards fire glass installations where the customer wishes to cover the entire fireplace floor in glass or surrounding lava stones. The surrounding glass can be mounded up to create a seamless transition to the burner that is not possible with the gas log retrofit style systems. Ventless Fireglass Sets - Ventless glass systems are more specialized than vented systems. Because there is always the danger of carbon monoxide being released from an improper installation, the vent free systems will usually use a purpose built platform with an inclusive valve that cannot be swapped. The system will use the same type of fire glass that vented systems will, but the specified sizing and quantity to use must be followed closely. 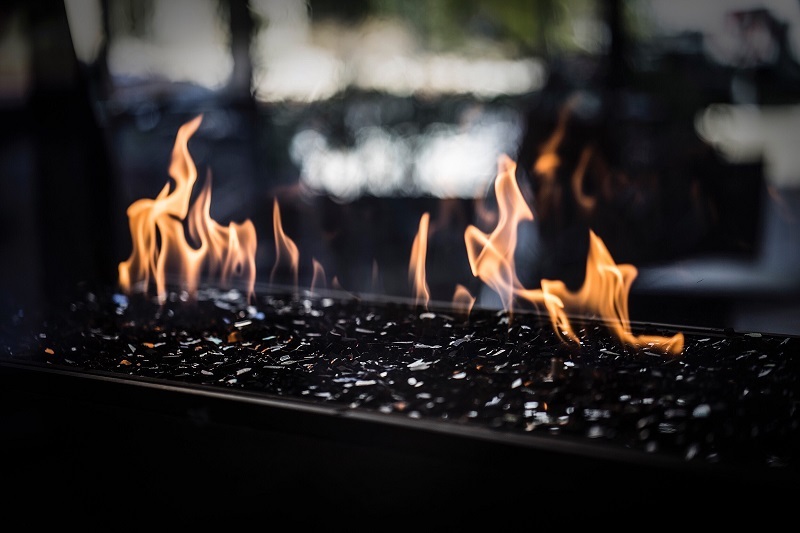 Because of their lower BTU output, the ventless systems usually include a burner that is clad in highly reflective surfaces to capitalize on the flame pattern. Front width - As implied, this is the width at the leading edge of the fireplace opening. Back width - This is the width at the very rear wall of the fireplace opening. Middle width - This is the measured width at the halfway back point in the fireplace opening. The front and rear widths can be added and divided by two if you know the fireplace walls to be perfectly straight. If the fireplace has an uneven taper or odd shape, the middle width must be taken manually. Height - This is the height measured at the very front of the fireplace opening. Masonry fireplaces will have a smoke chamber just behind the lintel bar across the top of the opening, but this extra chamber height should not be included in the height measurement. Once the measurements are in hand, and you have a general idea on what type of log set you're looking for, you can decide on a log set. Sizing requirements vary significantly by manufacturer, and there is no one set rule. Height requirements can range from 12 to 20 inches. Widths can be anywhere from 6 to 18 inches wider than the log set size. In most cases, the use of a valve assembly will increase the minimum size requirements, due to both physical size of the valve assembly and additional space needed for cooling. Many gas log shoppers believe you should install the largest log set possible into your fireplace, but if you take a moment to consider it, how often are wood burning fireplaces jam-packed full of wood? Think proportional sizing, and trust that the manufacturer sizing will be sized accurately. 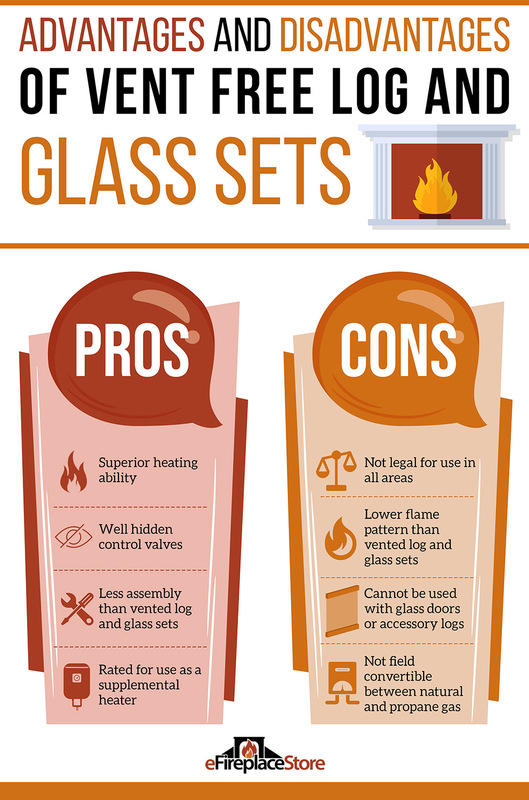 Alternatively if you're shopping for fireglass, you should know that the guidelines are much the same as with the gas log sets. The manufacturer will specify the required width, height, and depth that will be needed to accommodate each system, as well as the additional width or depth that may be needed for different valve options. An easy way to determine what gas logs meet your requirements is to utilize our gas log calculator at the top of this page to make sure that you get the best log set for your needs. Gas log sets are relatively simple to install. If the gas line does not already exist, we highly recommend that a licensed plumber or gas fitter be contacted to determine the best way to route the line and to safely perform the installation. With a gas line in place, gas log sets that are appropriately sized will go into place with no trouble. Manufacturers provide detailed installation instructions and most also provide the necessary flexible supply line and fittings that are needed for installation. It is incredibly important to follow installation steps correctly, to make sure that your gas log set is safe for use. Pipe thread sealant, adjustable wrenches, screwdrivers, and patience will all be needed for a gas log set installation. You will also want to get your existing chimney inspected, to make sure that it is structurally sound and not leaking as the presence of water will cause issues with your new gas log set. When the gas log set is properly installed, and the chimney is in good condition, it is easy to get 20 years of service out of a refractory cement log set with a simple standing pilot valve system. Electronic systems will usually see a failure of modules within 10 years, but the parts are common and easy to replace. Refractory fiber logs will often begin to break down after approximately 10 years of regular use, but again, replacements are available in many cases. However, if the chimney is not in good condition, and thus is leaking, then you won't get as long of a lifespan out of your gas log set. Before an installation commences, you should have the chimney inspected for leaks or structural issues that could lead to leaks down the road. Dampness can take a significant toll on a gas log set in as little as a year. Moisture will also have an effect on vent-free gas logs as well and is something to keep in mind even when one is no longer going to be using the chimney for venting purposes. Additionally, dampness in the chimney could result in mold growing in the structure of the home which becomes a massive health hazard if left unchecked.